We’ve only had a handful of swarms this year; and comparing notes with the OBKA swarms liaison officer they are seeing a similar lack of swarms across the county – he’s had about 6 calls where 2 years ago he’d have had 200 by now. [Although this number reduced dramatically after BBKA introduced the new online find-a-local-swarm-collector thing on their website]. He notes his bees are just staying in their hives rather than swarming. This reinforces our own group’s experiences: massive, crowded colonies. “I’ve never known a year like this” he says. “And in 2 – 3 weeks it won’t be worth collecting them as it will be too late in the year for them to build up stores for winter”. Currently we have ~20 people wanting ~40 swarms. Last year we collected at least 30 swarms and had expected no problem fulfilling our requirements. But as they say, bees don’t read the beekeeping manuals. So it looks like we will have a lot of disappointed people – we just have to use this as a useful lesson and learn what we can from it. Obviously if a swarm does show up, we’ll prioritise members with no bees at all. 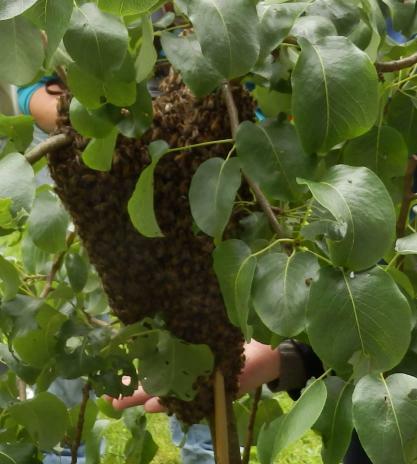 What we’re looking for: a nice big swarm… but this was back in 2016! They will not experience a brood break so parasite levels (especially varroa) will be high, so we will probably see a lot of deformed wings on colonies which have only recently switched to a no-treatment regime. On the other hand they will not squander resources swarming, their numbers will be high and you can expect them to build up bumper honey reserves this year. Watch for lots of drones, because when hives don’t produce queens (producing a swarm is a high risk strategy) they produce drones to pass their genes to whatever queens are in the area. Another thing we’ve seen is that of those swarms we’ve collected, several have immediately absconded (which was very rare in previous years). Gareth has commented that prime swarms have the oldest, most experienced workers and perhaps they’ve already preselected a new home if the mass of the swarm is kept in a while by poor weather. He’s seen a swarm come straight out of a hive and off to a new home without first clustering. So it may be an idea to hive swarms more than 3 miles from their pickup point, especially if we think they are prime swarms, so they don’t know where they are and are more likely to stay in the hive. However there is a balance to keep here as we know local bees thrive best in their own locale, so “not much more than 3 miles” is probably optimum. OBKA’s swarm control officer mentioned something else interesting: he has several apiaries and the ones on arable land had massive losses, 8/10 at one location. He saw they had some kind of problem back in June – they stopped being “hives of activity”. Forage problems? Whereas his hives in other areas, like on a livestock farm, were all fine and are producing good crops of honey. Again this reflects what Gino in an Oxfordshire village has commented on: rural honey yields these days seem to depend entirely on what farmers decide to grow near you, there is little wild land to forage on. This entry was posted in Ecology, Garden plants, Local lore, Swarms and tagged forage, June gap, weather. Bookmark the permalink. 9 Responses to Where are all the swarms this year? The swarm split into two and started crawling into the two hives next to the occupied one. I said to Ruurd that it would take between 45 to 60 minutes for them all to go inside. Within an hour they had taken possession of their new homes. These bees do not come from hives like my model and they are used to shorter and wide frames and separate frames for the honey storage. Mine are all one (einraumbeutes) and not only that they have hardly been used by bees at all up to now so are not exactly bee-enticing. Also they were empty of any wax comb. Whilst the last of those bees were going inside the air filled again with bees. First one swarm gathered on the outside of the greenhouse glass. Not at all a comfy place for a bee to be. I quickly brought to the back of the greenhouse a narrow hive with four einraumbeute frames in it. The kind you can take to a queen mating area. And to the garden path next to the greenhouse a regular einraumbeute. That was for the bees on the glass. I quickly pulled on my bee suit and cap and got my goose wing feather thingy and with that I gently scooped them from the glass, I was straddled over a flower bed full of forget me nots that I did not want to crush. So I scooped with one hand and twisted my body and gently tapped the goose feathers onto the top of the frames of this hive standing on the garden path sort of behind me. Got about 95% of the in and hoped the rest would find their own way. 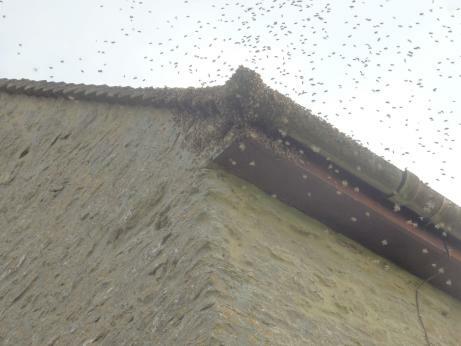 Meantime the 4th swarm was very very busy going into the narrow hive. All 4 are still in their new homes and within a very short time pollen was being carried inside so I knew the queens were all doing their job i have 3 in the apiary, one in the orchard and one in the front garden. How about that for a brilliant bee day. I think the bee estate agents must have been casing the joints beforehand and consensus had been reached by the bees. I had hardly anything to do with any of it. Only that feathering off the glass but that is logical help isn’t it? Congratulations Lindylou – what’s the emoticon for “seething with jealousy”?! It may be worth mentioning to readers that Lindylou is in the Netherlands. I also heard about several swarms on an allotment about 40 miles north of me: I don’t know yet if the lack of swarms is very local or not. Maybe its something to do with location; I live south of Abingdon, some distance from arable cultivation. Going into the winter I had just one colony collected as a small swarm on 8 May 2017, which survived well and swarmed again on 7 May this year (I missed it by 5 minutes, apparently). However, two days later I had a call for another small swarm – and then another one on 2 June. This is bad news as I have a bait hive out! My bee supplier who I have bees on order from cannot supply bees now as there is AFB in his local area. Interesting about a swarm being observed going straight from the hive to its new home. I’ve often thought this would make more sense for bees to do, to cut out the risk of hanging about in the open for a couple of days. I figured the only reason they didn’t was so that the bees investigating new homes could dance on top of the colony and reach a decision together. Hello Emily and other readers, in Honey Bee Democracy by Tom Seeley he writes fascinatingly about the decision making regarding where a swarm will finally choose their new home. What I wrote in inverted comnas “casing the joint” is quite seriously what they do, just like critical estate agents, they check every aspect of what’s on their market. Before May 7th there had been quite a few bees inside the apiary flying up and downwards on the backside and underneath of my empty hives. After the 7th when 4 hives became occupied in one afternoon I understood that those bees must have been the housing scouts. I hope your bait hive gets chosen Emily. Hi Lindy, what a great gift to have not one but four swarms in one day come to you! Your apiary location must be desirable indeed! My bait hive just came to use yesterday…a swarm conveniently arrived at my in-laws, low down on an apple tree! Very happy for you Emily. This is the 3rd year that my apiary is here so the bees are only just now finding it desirable. My neighbour Cor, is also a bee man. He lives about 500 meters away across a field. The new bees in my hives come from his hives. He has about 20 and he doesn’t do splits or any kind of treatment to the bees either. He told me he waves his hand towards our direction when his bees are bearding and tells them “fly that way… towards Lindy’s” apparently this year they were more inclined to do so. He sounds like quite a character! Kind of him to send you his bees.